As magnificent as Earth’s land can be in its natural state, it can also inhibit you from taking full advantage of your property. Retaining walls and seating walls can enhance your outdoor space, as well as perform important functions. With a retaining wall or seating wall from Topaz Design, you can get the most out of your yard and create the landscape and outdoor space that you have always wanted. What Do These Structures Accomplish? Retaining walls hold soil in place and create a level space for your property. With these walls, you can enrich your landscape with plants, flowers and trees. These walls are also a great way to introduce steps and walkways to let visitors embark on a journey toward your home or outdoor living space. Seating walls add another element of comfort to your home’s exterior. 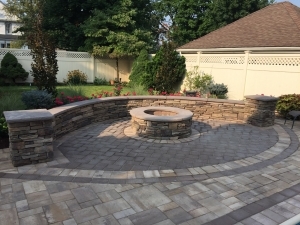 A seating wall can function as a retaining wall, or it can be a stand-alone feature to add additional seating in your outdoor space or fire feature. Seating walls are also a great way to define areas in your backyard space, as well as accentuate your patio. However you choose to incorporate your retaining wall or seating wall, Topaz Design offers the skillset and expertise to create your ideal outdoor solution. With a wide assortment of materials available, we fuse together our recommendations with your personal taste to find a style that matches your home. From natural stone, to masonry block or stone veneer, the possibilities are endless. To propel your outdoor sanctuary to its fullest potential, complete our online form and share with our team the project that you have in mind.